Bulgaria may not be first thought of those looking to book a skiing holiday but here at Chaletfinder, we have a great array of luxury ski hotels. Bulgaria is catching up with other more recognised ski destinations such as France, Austria and Switzerland and the abundance of cheap Bulgarian ski hotels available makes it the perfect choice for those people looking for an affordable snowboarding or skiing holiday. 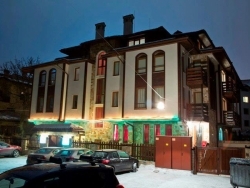 Bulgarian resort hotels are of the highest quality and here at Chaletfinder, we are delighted to offer a truly unparalleled selection to choose from for those after a Bulgarian ski hotel. The popularity of Bulgarian resort hotels is on the increase all the time and if you want to enjoy the peaceful slopes before it becomes a mainstream skiing destination call Chaletfinder on +44 (0) 161 408 0441 and book you Bulgarian ski hotel today. Skiing holidays are becoming more and more popular and Bulgaria is rapidly emerging as a ski hotspot and here at Chaletfinder we are delighted to offer an excellent range of ski hotels. Bulgaria has a number of different resorts to choose from and we are confident of finding the perfect Bulgarian ski hotel for you. If you can't find the right type of Bulgarian resort hotels here at Chaletfinder, just give us a call on +44 (0) 161 408 0441 and we will work together to find the best cheap Bulgarian ski hotels out there.